I have been eying up this recipe in Veganomicon ever since I got it, so I’ve no idea at all what’s stopped me from making it for so long. You might think it was availability of yuca, but I can get it fairly easily fresh and very reliably frozen. I’d never tasted it before so I was a bit unsure what to expect but that doesn’t normally stop me either. I decided to buy my yuca frozen (the bag says tapioca chunks but the man in the shop assured me it’s the same thing; you might see it called cassava too). I expected it to be a bit like sweet potato but it’s not really – it’s starchy but the taste isn’t all that pronounced. I’d say it was more like a starchier version of a normal potato, so if you can’t find yuca I bet normal potato would work too (or someone on the PPK suggested using mashed white beans). I made 2 of the variations in the book – one was sweetcorn, mushroom and black olive and the other was spinach and coriander. They were both really easy to make and I loved both of them too – I probably marginally preferred the sweetcorn version but it was nice having the mixture. I served it with tropical salsa which is also in the book, and it brought a fresh, zingy taste to the meal. I loved this meal and will definitely be making it again, both repeating the ones I tried and trying the other variations too. Highly recommended. 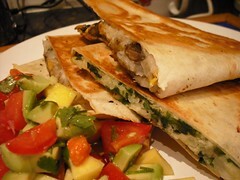 This entry was posted in Veganomicon and tagged tortillas, vegan by efcliz. Bookmark the permalink. I really like the look of that recipe. It’s the availability that has stopped me from making it. I can’t find it anywhere in Brisbane, even though I look about a lot! I can’t find it either…but after seeing this post, I’m going to expand my search! Those look delicious!